Check out the latest Game of Thrones Box Spoilers on My Subscription Addiction! Game of Thrones Box Spring 2019 Spoiler #2! Game of Thrones Box Spring 2019 Spoiler #1! Game of Thrones Box Spring 2019 Theme Spoiler! Game of Thrones Box Summer 2018 Theme Spoiler! Game of Thrones Box Spring 2018 Theme Spoiler! Game of Thrones Box Spoiler #2 + 10% Off Your First Box! 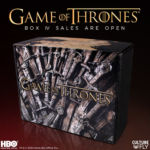 Game of Thrones Box Spoilers + 10% Off Your First Box!